Neri 1598-1600 (Ferguson 67), f. 5r. 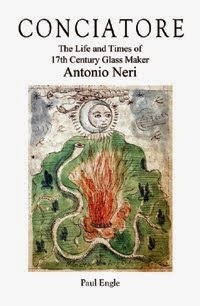 Over a decade before Antonio Neri wrote L’Arte Vetraria, the book on glassmaking for which he would become famous, he wrote an illustrated manuscript on the subject of alchemy. Begun around 1598 and completed in 1600, this is Neri's earliest known work, written very shortly after he was ordained as a Catholic priest. The illustrations are divided between technical depictions of chemical apparatus and allegorical images meant to show philosophical relationships within the natural world. Two of Neri's pictures from this latter group, respectively, show veins of gold and silver growing in the earth. The veins are depicted exactly like the arteries of an animal. In both pictures, they radiate out around fiery holes in the ground, what one might presume to be volcanos. Overhead the sun shines down on the gold and the moon over the silver. Further up in the sky, Neri shows the constellations associated with each metal; Leo the lion for gold and Cancer the crab for silver (his rendition looking more like a lobster). It was no flight of fancy that mined metal and ore deposits were depicted as literal veins. It was widely thought these were living structures, which carried the earth’s nutrients. 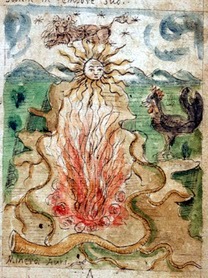 In one of Neri's final works, his 1613 manuscript Discorso, he explains the ancient theory that gold could occur as immature seed material, left over from the primordial creation. If properly nourished, this seed would mature and grow into the precious metal, and with the appropriate knowledge this natural process could be restarted, or accelerated and the gold could be brought to perfection by artificial means. Antonio Neri, "The Mineral Silver"
Neri 1598-1600 (Ferguson 67), f. 6r. Tonkin, in Carew's survey of Cornwall: "Whether tin doth grow again, and fill up places which have been formerly wrought away, or whether it only seperateth itself from the consumed offal, hath been much controverted, and is not to this day decided." And "whether—dead lodes—that have not one grain of tin in them—may not hereafter be impregnated, matured, and prove a future supply to the country, when the present lodes are exhausted, I think well deserves our highest consideration." At base, this is not superstition nor wild speculation, but rather considered judgments of thoughtful men making careful observations. Mines were often attended by acidic or other caustic liquids, either produced naturally or by washing operations, which leached out and dissolved various solubles. These liquids could sometimes dissolve metal out of ore and redeposit it elsewhere. Abandoned mines, it was noticed, could exhibit new crystal growth after a period of years or centuries. Today, the redeposition of minerals is a well accepted phenomenon, however, where it does occur it takes place not on a human time scale, but on a geological one, over millions of years. *This post first appeared here in a slightly different form on 2 December 2013.